ClubCoins Nødvendigt: 200 Please note that, for now, you cannot download content from our platform directly onto a mobile device (phone, iPod, iPad, tablets...). You need to download your items onto a PC or Mac, and then transfer them onto your device in the normal way. We are working on allowing direct downloads to mobile devices but this is not possible in the current version of the platform. Sorry about the inconvenience! After the publication of Atlas Shrugged in 1957, Ayn Rand turned to nonfiction writing and occasional lecturing. Her aim was to bring her philosophy to a wider audience and to apply it to current cultural and political issues. The taped lectures and the question-and-answer sessions that followed added not only an eloquent new dimension to Ayn Rand's ideas and beliefs but also a fresh and spontaneo… us insight into Ayn Rand herself. 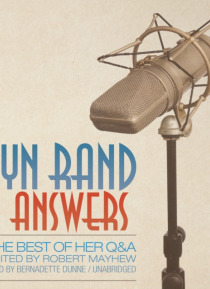 Ayn Rand Answers is a collection of those enlightening Q&As. Topics covered include ethics, Ernest Hemingway, modern art, Vietnam, Libertarians, Jane Fonda, religious conservatives, Hollywood communists, atheism, Don Quixote, abortion, gun control, love and marriage, Ronald Reagan, pollution, the Middle East, racism and feminism, crime and punishment, capitalism, prostitution, homosexuality, reason and rationality, literature, drug use, freedom of the press, Richard Nixon, New Left militants, HUAC, chess, comedy, suicide, masculinity, Mark Twain, improper questions, and more.